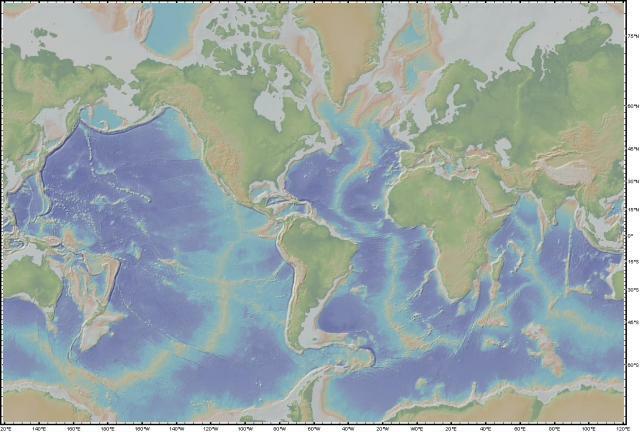 The Global Multi-Resolution Topography (GMRT) synthesis is a continuously-updated compilation of seafloor topography including multibeam bathymetry data from throughout the global and coastal oceans (view contributors). It is maintained as a multi-resolution gridded digital elevation model of seafloor bathymetry to ~100 m spatial resolution. More information about GMRT is available on the GMRT Data Portal, and users can create custom maps and grids. This image was generated with GeoMapApp.